SpyShelter Firewall is a robust firewall for Windows-based systems equipped with numerous security tools all wrapped in a clean and intuitive interface. The application was designed to keep your computer safe against data theft and malicious attacks. SpyShelter Firewall includes various modules that as a whole can safeguard your system against logging various information such as clipboard entries, keystrokes, webcam and screen activity and even sound recording. The interface is organized into several panels where you can see your computer’s current protection status and manage rules for your installed apps that are using your Internet connection. You can create lists with third-party applications you want to be blocked, but also create writing restrictions for your folders and even for removable drives. Also, you can allow a tool to capture live streaming from your webcam, but prevent it from recording audio. 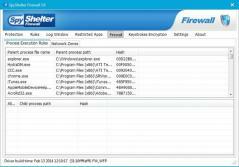 The built-in firewall can be customized in a number of ways. As a result, you can select which connections are allowed or denied, set up rules for executed processes and edit the trust level for networks. You can also set the firewall to automatically allow certified apps and other software that’s considered safe.